Prepare a 200- to 300-word history about the National Critical Technology (NCT) technical application your team has selected to solve a local or national problem. Richard Feynman, in a 1959 speech, "There’s Plenty of Room at the Bottom", suggested that it's possible to build machines small to enough to manufacture with atomic precision. His work was continued by Eric Drexler, who introduced the word "nanotechnology" in his 1986 book "Engines of Creation". His book accrued so much celebrity that nanotechnology received research funding in the National Nanotechnology Initiative. Since our national critical technical application is nano-optics we began by investigating the developing technologies of photonic crystals, liquid crystals, and moth-eye diffraction gratings to diminish or eliminate unwanted glare on the windshield. Lord Rayleigh studied electromagnetic wave propagation in simple, one dimensional photonic crystals in 1887; yet it was not until 1987 that Eli Yablonovitch and Sajeev John suggested that three dimensional crystals could be used to reflect specific wavelengths. In 1888 Friedrich Reinitzer discovered the concept of liquid crystals. He found that cholesteryl benzoate has two melting points- the first is a cloudy liquid and the second is a clear liquid. The cloudy liquid has the optical properties of a crystal and is the precursor to modern liquid crystals. In 1967, C.G. Bernhard and D. Ottosan, of the Karolinska Institute in Sweden, discovered the diffraction properties of the nanostructure of a moth's eye. 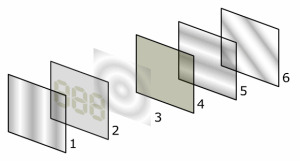 MacDermid Autotype, an affiliate of the Fraunhofer-Gesellschaft, developed and patented the first artificial "moth-eye diffraction grating" in 1999 and calling it MARAG (Moth-eye Anti-Reflective, Anti-Glare). Despite the promising nature of the first two technologies our team chose moth-eye gratings due to inherent limitations. The behavior of light becomes too difficult to predict when many photonic crystals are applied to a large surface and liquid crystals are temperature dependent making it difficult for them to withstand outdoor temperatures. the institution where the research is or was being conducted. Prior to citing our related grants, we would like to present three patents granted by the US Patent Office that directly support our project's goal. #6647166 Transition Metal Switchable Mirrors by Pam Siedenman. This technology employs a thin film coating on glass that, when exposed to a small electric current, will change from transparent to reflective and all levels in between. The coating is a metal alloy containing magnesium and a transition metal instead of rare earth metals, as other companies have. The use of the alloy reduces cost and increases effectiveness. Transition Metal Switchable Mirrors (TMSM) allow for better transmission of light and 75 to 10 percent better reflectiveness than current films. Current windows only have the ability to darken but not become opaque, the current windows also "have little effect on infrared radiation". The technology if used in cars could help cut up to 80% of the heating and cooling equipment. #4965121 Solar control layered coating for glass windows by Young, Paul I. and Wolfe, Jesse D. This "stack" of glass which has five layers minimizes the amount of radiation to come through the vehicle so that it barely reached the legal level of glass. This glass allows a proportion of the sun rays while the remainder is reflected by a coating. Typically, the coating that is used would be a neutral color which is desirable for trucks and automobiles. Patent # 6958207 Method for producing large area antireflective microtextured surfaces by Niyaz Khusnatdinov and Tanwin Chang. This patent involves producing a "mask" to create a microstructure surface with antireflective properties. The process involves using photolithography to create a pattern in a light sensitive material. The material is then processed to obtain the micro-textured surface. The surface is made up of many peaks and valleys. The peaks can be arranged in any design desired. 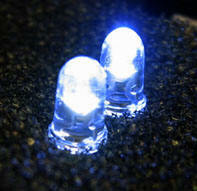 The antireflective properties are designed for visible light. The process is readily scaled up to large areas in inexpensive polymers. A two-year grant was awarded in 2006 by the National Highway Transportation Safety Administration to Mark S. Rea, Ph.D, the director of the Lighting Research Center at Rensselaer Polytechnic Institute, in the amount of $890,012.00. This grant was awarded for researching the causes and effects of headlight glare and developing technological solutions. LRC has already conducted extensive research on the causes of headlight glare. They have found that the high wavelength (blue light) of the light from HID bulbs helps to increase visibility for the driver using them, but also increases the amount of discomfort glare experienced by other drivers. They have also found that glare negatively affects both sides of the peripheral vision of drivers. This current research project will further their concepts of glare, and the end result will be a form of headlamp designed to maximize luminous intensity of the road while meeting standard requirements and minimizing glare. In April of 2004, two researchers were awarded $250,000 for their investigations into moth-eye diffraction as a glare reducer. Byung H. Kim and Justin Piccirillo won the Carrot Capital Business Plan Challenge, a competition between 20 teams from business schools all across the country. The University of Massachusetts at Amherst gave these two men the ability to produce and develop their ideas. Their idea will drastically reduce the cost of anti-reflective coatings for LCD monitors and LCD TV’s - from thirty dollars per square foot to fifty cents per square foot. A two-year, 155,646 British Pounds ($304,116.71 US Dollars) grant was awarded to Professor C Wilkinson of the University of Glasgow to investigate mechanical methods of imprinting nanostructures over large areas. One of the technologies investigated was the anti-reflective properties of the moth-eye coatings. Although the grant began in 1997 and ended in late 1999, putting it outside the designated timeline, it is relevant to this project because of the large scale of imprinting. A three-year grant starting on November 8, 2004 worth 430,639 pounds (846,377.891 US Dollars) was awarded to Professor AJ Turberfield of Oxford University for his investigation into creating photonic crystals with a predetermined interference pattern. In this grant they will be investigating the doping of photonic crystals to create a band gap for a given frequency. Through the use of a 3D-holographic laser an interference pattern is formed on a light sensitive material. The researchers also are investigating the effect of structural defects on the optical properties of the crystals. The results of this research will be useful for optical semiconductors. Based on the research your team has done, explain how the NCT application chosen has advanced scientific knowledge. Nanotechnology has greatly affected the world of optics. Applications of nanotechnology that we investigated were in the form of moth-eye diffraction gratings, photonic crystals, and liquid crystals. The coating of MARAG used in this application reduces visible reflection to less than 0.5%, is easy on the eyes, and provides an improved viewing angle. The film has "excellent hardness, scratch resistance, chemical resistance, and good formability"
This hard, broadband anti-reflective, polymer coating has little dependency on the viewing angle. In addition to providing good contrast and brightness, it is scratch and chemical resistant. Photonic crystals have potential application in optical fiber, optical sensors, atomic optics, and fiber lasers. However, the most widespread application is digital optical communications, due to massive information traffic of today's world. Their ability to reflect, trap, and guide light of certain wavelengths allows the photonic crystals to be integrated in electric circuits of communication devices. Currently, when data is sent over an optical wire it is converted from an electrical signal to an optical signal, and back to an electrical signal. As data traffic increases, either the more optical fibers are installed or data is sent over existing fibers, and more robust electronic devices are installed to process larger amounts of optical signals to electrical signals. Photonic integrated circuits could solve this problem by routing incoming optical signals without converting them to electrical signals. This device would put many components on the receiving end of the wire into one circuit, thus cutting costs of optical technology. Photonic crystals can also be used in the laser industry. For example, in ultra high power fiber systems, light from a powerful laser could be directed by photonic crystals to a cutting head used in surgery. Another example would be when a photonic crystal fiber is used to guide atoms or particles over long distances, forming the basis of fiber devices that carry matter. Photonic crystals have also improved the light extraction efficiency in light emitting diodes (LEDs), making them brighter and more energy efficient. Another potential application of photonic crystals is capturing fingerprints. Using the crystal's elastic property, the new technology would capture a fingerprint in multiple colors. This will be done by elastically deforming crystals to block out partial light, certain wavelengths, and thus certain colors. The new application would capture the print in still images and video, recording pressure patterns and surface ridges not visible to the naked eye. Even if a plastic replica was made of a person's finger, the pressure image would look different on the model because plastic material is less soft than a normal finger. From a biometric perspective, the technology is a major improvement in security. The sensor technology can also be applied to airbag mechanisms in cars, or even strain and torque sensors on support beams of high rise buildings. The most common use of liquid crystals is liquid crystal displays (LCD). Liquid crystal displays are used for things as complicated as computer monitors and television screens, but also for things as simple as pocket watches and cell phones. LCDs are made up of two plates of glass or plastic with a thin film of liquid crystals between the two. The plates of glass are normally created with transparent electrodes made out of indium tin oxide. These electrodes make it possible to establish an electric field across the crystals. The final step is to place crossed polarized filters on either side of the glass plates which will allow only the polarized light modified by the liquid crystals to be transmitted. Glass substrate with ITO electrodes. The shapes of these electrodes will determine the dark shapes that will appear when the LCD is turned on. Vertical ridges are etched on the surface so the liquid crystals are in line with the polarized light. Horizontal filter film to block/allow light passage. Liquid crystal thermometers make use of cholesteric liquid crystals whose alignment axes (or directors) form a helical pattern which is reliant on temperature. Consequently by looking at what shade of color is being emitted from a crystal thermometer, you can tell the temperature of whatever you are trying to calculate. This temperature dependence is also the basis of "mood rings." A use of liquid crystals that is currently being researched is optical imaging. In optical imaging liquid crystal cells are placed between two layers of photoconductors. Impinging light heightens the photoconductor's conductivity, creating an electric field across the liquid crystals that is dependent on the intensity of light. The pattern coming from the liquid crystals is then transmitted by an electrode and recorded as an image. "Liquid crystals are already used commercially for making windows which turn from opaque to transparent with the application of an electric field..."1 There doesn't appear to be any way liquid crystals could be used to make an antireflective structure.